Through the decades she would repeatedly return to the Southlands – dependant on the political climate, national and international – to “that particular stretch of desert,” between Tozeur and Tolga, that in her words “we have always felt was especially given to us for our corner,” eventually setting up a permanent winter post. The artist in her responded to the artist in the Sufis, their great writers of old being as much poets as philosophers. Her heart responded to their efforts to seek after God. In contrast to the cold formalism of orthodox Islam, she found in certain Sufi mystics -particularly of the lay brotherhoods – sincere hunger for things of the spirit. She made it a point of serious study to understand not only what they believed but how to establish effective dialogue with them. “Till you show them by some word that you understand them and care for them and are ‘reaching forth’ also to ‘the things that are before,’ they will remain within their shell.” Lilias penetrated that shell with her love, sensitivity, and profound understanding of their way of thinking. “She knows about The Way,” they would say of her. Toward that end, at the close of her life, she completed a work – arguably her magnum opus – written specifically for the Sufi Mystics: The Way of The Sevenfold Secret. Lucid, elegant, and strong, it appealed to the common ground shared by Christian and Sufi alike: the purpose of discovering the secrets of divine truth and divine power. Addressing the Sufi’s means of seeking divine union through a succession of seven spiritual states, which in the end still may not please what they see as an arbitrary God, she presents an alternate path “Wherein we have found joy and peace from the first step.” She takes the seven sayings of Christ about Himself contained in John’s Gospel and explores how each offers the “secret” for which the Sufi’s long: Satisfaction (Bread), Illumination (Light), access (Door), Leadership (Shepherd), life (Resurrection and Life), progress (Way), and the ultimate union (Vine). We, like Lilias, are connected with people who may not have the same sensibility as her beloved “sons of sunshine” but for whom there is a longing for truth. Who are the soul thirsty people in my life? What have I done, what am I doing, to understand their hearts? To what extent have I made it my intent to understand the constructs which motivate their assumptions and actions? Am I willing to engage with them in our search for the deep things of God? 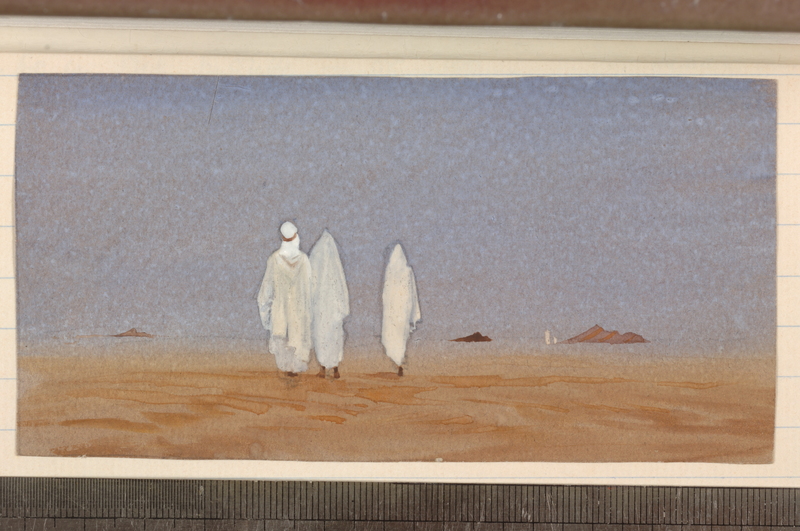 This entry was posted in Islam and tagged art, Islam, Lilias Trotter, Sufi mystics, The Way of the Sevenfold Secret. Bookmark the permalink. Thank you so much for the link to The Way of the Sevenfold Secret. I know someone who might be interested in reading it, but first I’m going to read it myself and pray about sending it on at the right time. This truly is a “classic” written by Lilias, specifically for the Sufi Mystics (with “sons of sunshine” even helping her with the Arabic translation) – and the culminating work of her life. It also, in my way of thinking, has application for today with the current emphasis on “spirituality” – Lilias distilling a comprehensive view of the essence of Christianity through the “I Am’s” of Jesus. Excellent point; I look forward to reading it.